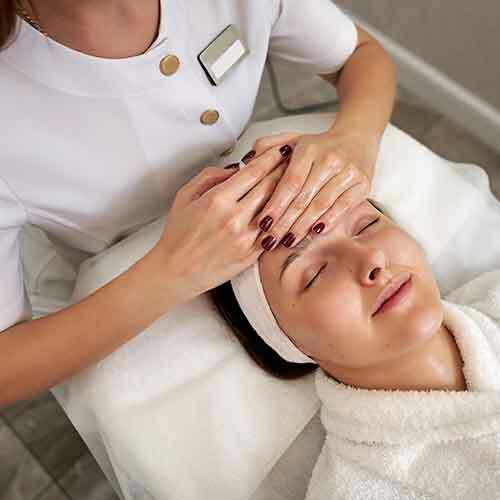 The works facial treatment is the combination of Microdermabrasion, Dermaplaning, chemical exfoliation and oxygenation on the face, neck, chest and hands! The “Works” Facial Treatment: ALL FOUR treatments in one session! Why choose just the face when it’s just as important to treat all the areas that draw attention to your skin’s health and age. These are the areas that are exposed the most to the sun’s damaging rays and abuse. Microdermabrasion, Dermaplaning, Chemical Exfoliation and Oxygenation performed in conjunction with one other, produces dramatic results. The Microdermabrasion and Dermaplaning will get rid of the dead surface cells for the peel to penetrate more evenly and effectively. Oxygenation will help hydrate and provide the skin necessary nutrients for optimal results. Microdermabrasion exfoliates dead skin cells to lighten and brighten your skin. Particularly great for large pores and congested skin, Microdermabrasion leaves the skin soft and smooth instantly without any pain or downtime. Chemical Exfoliation is great for fine lines, stimulating collagen and elastin production, lightening brown spots (hyperpigmentation), great for blackheads, whiteheads, and acne. These peels are considered no downtime with minimal flaking a few days later. Enzymatic Peels are peels that use enzymes to gently eat away at the skin’s layers as a method of exfoliation. These are great at addressing these same concerns without the peeling. A peel that uses enzymes to “eat away” at skin lay. Oxygenation increases blood flow to your dermis delivering vitamins and nutrients. This is how your skin gets what it needs to manufacture more collagen and elastin. Oxygenation is excellent for dull, dry, dehydrated and/or lackluster skin. It is very hydrating and is great for acne prone skin as bacteria cannot survive in an oxygenated environment.